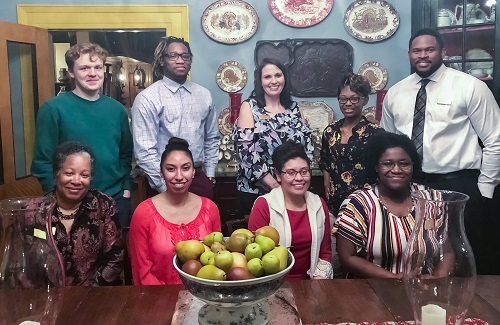 Edgecombe Community College Student Ambassadors and SGA officers enjoyed a lesson on social graces recently at Myrtle Grove Plantation. Students were treated to a seven-course meal and instruction on dining etiquette, presented by Karen Andrus, former executive director of the ECC Foundation. From left are (seated) Sharnell Pittman, Marianela Lopez, Olga Bautista, Ny’Asia Dickens-Jones, (standing) Kenny Harrell, Tyshun Powell, Gina Coldwell, Jayla Royster, and Detron Phillips. Students agreed that the tips will come in handy during a business interview or at a formal social setting.